Aaaahh, with Fall comes leaves changing, crisp air…and unfortunately, cold and flu season! 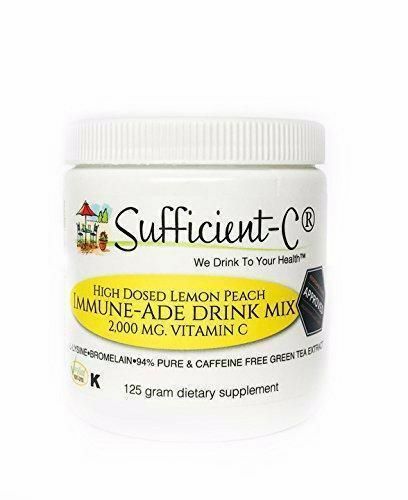 Here’s something to help you stay ahead of illness this season: Sufficient-C, a new high dose “immune-ade” drink mix. Not only does it have a whopping 2,000mg of vitamin C (we all know how important that is for staying healthy!) per serving, but it also contains a generous dose of immune system boosting L-lysine and anti-inflammatory Bromelain plus pure green tea extract. There’s no added sugar or sugar derivatives which can impede vitamin C absorption; just a bit of organic, premium grade stevia for a little sweetness. The powder dissolves completely in water, leaving you with a light, lemonade-like beverage with a hint of peach flavoring. So drink to your health with Sufficient-C and enjoy “flavor with function”!